alaTest a collecté et analysé 161 avis de consommateurs et d'experts pour le produit Sony BDP-BX59. La note moyenne du produit est 3.5 sur 5, tandis que les autres produits de même catégorie ont une note moyenne de 4.0 sur 5. Après analyse des notes de consommateurs et d'experts, de l'âge du produit ainsi que d'autres facteurs, et comparé aux autres produits de même catégorie, le Sony BDP-BX59 obtient un alaScore™ de 76/100 = Bien. This device lets you watch and play in 3D in relative privacy. Despite its downsides – including its expense – the Sony Personal 3D Viewer is an OK option for watching or playing 3D in relative privacy. I am a reasonably Nongeeky person when it comes to things like this but this was so easy for me to set up and learn to use, I got Netflix streaming account set up and I was ready to go! I just love this machine it's the greatest. We love this Blu-ray Player. We have enjoyed using the Netflix and Hulu Plus features. Great price and easy to set up. I didn't think there was a big difference in Blu-ray to HD but there is. 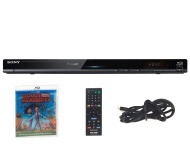 This Sony product is easy to set up and use. I highly recommend this product. Love the product, I'm sorry that I didn't order 2 more.